Karen von Borstel is the Facility Manager at Camp Howard and an excellent writer. 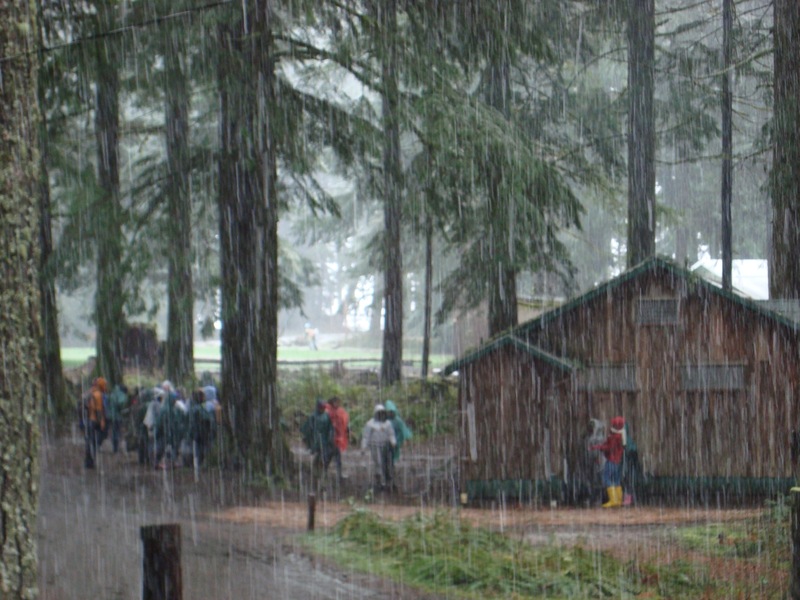 She is our guest blogger today writing about her observations of sixth graders attending Multnomah county Outdoor School Program at the Camp Howard site. The first yellow school busses arrived at Camp Howard today, loaded with 6th graders participating in Outdoor School. As the busses passed by the house I could hear the kids singing their camping songs, so excited to be here. Camp greeted them with a spring hailstorm and Outdoor School Counselors lining the road singing as the busses went past them. The students departed the busses in their rain coats with their waterproof shoes, laughing and singing, oblivious to the hail, and I was able to watch Camp Howard come alive once again with the infectious joy these children bring with them. Camp has been resting the past few months, catching her breath, as we put some new boards up, painted here and there, and repaired a toilet or 2. The wildlife has taken over camp. The robins have moving in, conducting their mating rituals and patrolling the fields for worms. The camp deer wander through camp taking time to lie down and nap if they wish. The 4-point bull elk that wintered in camp just shed his antlers in the upper field. It will take a few days for them to adjust to the new arrivals, but they will, and the campers will be so excited to catch a glimpse of the animals and birds. Outdoor School students will begin their day here at 7:00AM wakeup and then report to the Dining Hall for 7:15 table setting, flag raise, and the weather report. They will eat a hot, hearty, breakfast prepared for them in the kitchen, then on to cabin clean up and camp duties. At 9:00AM they report to Field Studies where they will learn about soils, water, plants, and animals. At noon they will eat another great hot lunch and they will be hungry. They will have walked several miles by now, through the woods, in all types of weather. They will devour that lunch and then head back out to Field Studies. At 4 PM it is snack time and then recreation. At 5:30PM they will have their evening flag ceremony, do their weather report, and prepare for 6PM dinner. This dinner will be a big hot homemade meal with hot homemade rolls topped off by dessert. They will eat like High School Football players. At 8PM they will have campfire and then lights out by 9:45PM. They will lay in their bunkbeds hearing noises they have never heard before, giggling, turning their flashlights on and off, scaring one another, walking to the bathhouse in pairs, whether they really need to go or not, just experiencing the night in the woods. They will spend the remainder of the week here, walking miles every day, making new friends, experiencing nature like most of them never have in their lives. It is a wonderful experience just watching this process. What an adventure! They will leave Friday, worn out, but with memories they will hang onto forever. Hi there , I’m lyndsay , I really enjoyed looking at all the pictures an reading ur post ,it brang back so many old memories I went to camp Howard when I was in 6th grade I went to MT.Tabor middle school I think it was in 1995 I’m bad at math lol I graduated in 2001 , anyways my son got that wonderful chance to experience the fun an amazing time I got to when I was young there cuz his class went there as well, I’m writing because I lost all my pictures an memories of when I went I wish I could remember our cabin name to tell my son an daughters they will be going in a few years as well an I was wondering do u guys have access of pictures or records from when I went or others if they wanted to see picture iv always wanted to see what picture might have been just to look back at sutch fun an wonderful memories would be a blessing if u have any info on how or if I could look at pictures of when my class went my 6th grade teacher was mr. Alausino I cant really remember how it was spelled but thank u for sharing sutch beautiful picture an story’s with us it makes me miss those days so much an treasure them . Thank you.